This article is about the Former American drug trafficker. For the book about him, see Freeway Rick Ross (book). 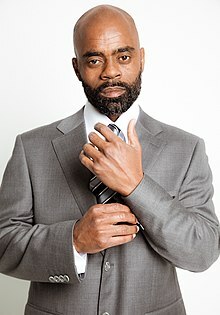 Ricky Donnell "Freeway Rick" Ross (born January 26, 1960) is an American author and convicted drug trafficker best known for the drug empire he established in Los Angeles, California, in the early to mid 1980s. He was sentenced to life in prison, though the sentence was shortened on appeal and Ross was released in 2009. Ross has said that when he first saw crack cocaine as a teenager in 1979, he did not immediately believe it was a drug because it looked different from other drugs he had seen. The nickname Freeway came from Ross owning properties along the Los Angeles Harbor Freeway and living next to Interstate 110. According to an October 2013 Esquire magazine article, "Between 1982 and 1989, federal prosecutors estimated, Ross bought and resold several metric tons of cocaine," with Ross's gross revenue claimed to be more than $900 million (equivalent to $2.7 billion in 2018) and profits of almost $300 million ($900 million in 2018). During the height of his drug dealing, Ross was said to have sold "$3 million in one day." According to the East Bay Times, "In the course of his rise, prosecutors estimate that Ross exported several tons of cocaine to New York, Ohio, Pennsylvania and elsewhere, and made more than $500 million between 1983 and 1984." In 1996, Ross was sentenced to life imprisonment under the three-strikes law after being convicted for purchasing more than 100 kilograms of cocaine from a federal agent in a sting operation. Later that year, a series of articles by journalist Gary Webb in the San Jose Mercury News revealed a connection between one of Ross's cocaine sources, Danilo Blandón, and the CIA as part of the Iran–Contra affair. Having learned to read at the age of 28, during his first stint in prison, Ross spent much of his time behind bars studying the law. He eventually discovered a legal loophole that would lead to his release. Ross's case was brought to a federal court of appeals which found that the three-strikes law had been erroneously applied and reduced his sentence to 20 years. He was released from Federal Correctional Institution, Texarkana on September 29, 2009. Ross was arrested in October 2015 on suspicion of possessing cash related to the sales of illegal drugs when police discovered $100,000 in his possession during a traffic stop. Ross later alleged that he had been racially profiled and stated that he was carrying a large amount of cash for the purchase of a home. Charges were ultimately dropped, and Ross explained he had earned the cash from book sales and speaking fees. Ross began selling cocaine after his illiteracy prevented him earning a tennis scholarship for college. He began spending time with an upholstery teacher at a Los Angeles community college who revealed he dealt cocaine and offered Ross a small amount to sell. Ross used his profit to purchase more cocaine to sell, expanding his small operation. Ross eventually began to ask for quantities to sell that exceeded what the teacher was willing to procure, so he turned to find a new dealer. The teacher referred Ross to his supplier, Ivan Arguellas, who offered to keep Ross supplied. Arguellas was able to provide larger quantities at a better price, and Ross quickly went from dealing in grams of cocaine to dealing in ounces. About eight months after becoming Ross's supplier, Arguellas was shot in the spine, resulting in months of hospitalization that forced him out of the cocaine business. His brother-in-law Henry Corrales took over the business, but was not enthusiastic about the trade and had failed to make any connections of his own to suppliers. A Nicaraguan exile and cocaine distributor named Danilo Blandón was acquainted with Arguellas and Corrales, and although he did not know him personally, was impressed with the amount of cocaine that Ross was moving. Blandón offered to supply cocaine to Corrales to sell to Ross, for a fifty-fifty split of the profit. Eventually, Corrales lost his appetite for the cocaine business and retired, at which point Ross became a direct customer of Blandón. Through his connection to Blandón, and Blandón's supplier Norwin Meneses Cantarero, Ross was able to purchase Nicaraguan cocaine at significantly reduced rates. Ross began distributing cocaine at $10,000 per kilo less than the average street price, distributing it to the Bloods and Crips street gangs. By 1982, Ross had received his moniker of "Freeway Ricky" and claimed to have sold up to US$3 million worth of cocaine per day, purchasing 455 kilos of cocaine a week. Ross initially invested most of his profits in houses and businesses, because he feared his mother would catch on to what he was doing if he started spending lavishly on himself. In a jailhouse interview with reporter Gary Webb, Ross said, "We were hiding our money from our mothers." He invested a portion of the proceeds from his drug dealing activities in Anita Baker's first album. With thousands of employees, Ross has said he operated drug sales not only in Los Angeles but in places across the country including St. Louis, New Orleans, Texas, Kansas City, Oklahoma, Indiana, Cincinnati, North Carolina, South Carolina, Baltimore, Cleveland, and Seattle. He has said that his most lucrative sales came from the Ohio area. He made similar claims in a 1996 PBS interview. According to the East Bay Times, "In the course of his rise, prosecutors estimate that Ross exported several tons of cocaine to New York, Ohio, Pennsylvania and elsewhere, and made more than $600 million in the process." Adjusting for inflation using the Consumer Price Index, this becomes more than a billion dollars in 2013. Much of Ross's success at evading law enforcement was due to his ring's possession of police scanners and voice scramblers. Following one drug bust, a Los Angeles County sheriff remarked that Ross's men had "better equipment than we have." Ross's capture was facilitated by his main source, drug lord Oscar Danilo Blandón, who set up Ross. Blandón had close ties with the Contras, and had met with Contra leader Enrique Bermúdez on several occasions. Blandón was the link between the CIA and Contras during the Iran–Contra affair. Gary Webb interviewed Ross several times before breaking the story in 1996. Ross claims that the reason he was unfairly tried initially was because of his involvement in the scandal. Blandón received a 24-month sentence for his drug trafficking charges, and following his release, was hired by the Drug Enforcement Administration (DEA), where he was salaried at US$42,000. The Immigration and Naturalization Service was ordered to grant Blandón a green card, despite his criminal convictions, to allow him to work for the DEA. On June 18, 2010, Ross sued rapper Rick Ross (real name William Leonard Roberts II) for using his name, filing a copyright infringement lawsuit against Ross in a California Federal Court. Jay-Z had been called to testify in the lawsuit, as he was CEO of Def Jam when Ross was signed to the label. Ross sought $10 million in compensation in the lawsuit. After the lawsuit was dismissed on July 3, 2010, the album Teflon Don was released as scheduled on July 20, 2010. A federal judge ruled that the case should be refiled in California state court because it fell under California state law. Ross refiled the case with the State of California and the federal case is on appeal in the United States Court of Appeals for the Ninth Circuit. The state case was filed in 2011 in California. Ross refiled in Los Angeles Superior Court with publicity rights claims. Trial was set for early May 2012. The case was dismissed by a judge in the Los Angeles Superior Court. The California State case was updated with a motion in Freeway Rick Ross's favor as to Warner Bros. Records and their use of the name and image Rick Ross in July 2012. In 2013, The Huffington Post reported that journalist and author Cathy Scott was co-writing Ross's autobiography with him, scheduled for release in 2014. The memoir, Freeway Rick Ross: The Untold Autobiography, was released at a book launch with author Scott at the Eso Won Bookstore in Los Angeles on June 17, 2014 to a standing-room only crowd. KCET TV in its review wrote, "(The book) is fascinating for its unsentimental, inside look at his career on the streets of South Central, which started for Ross with car theft and quickly shifted to drugs and the big time." The memoir was nominated for ForeWord Review's IndiFab Best Book of the Year Award 2014 in the true crime category. In June 2015, winners were announced, with the book named as a Foreword Reviews' 2014 INDIEFAB Book of the Year Award Finalist, True Crime. Ross was a key figure in filmmaker Kevin Booth's documentary American Drug War: The Last White Hope. The second episode of the first season of BET's American Gangster documentary series was focused on the story of Ricky Ross and his connection to the Iran–Contra scandal. Ross was a guest interview on VH1's Planet Rock History of Crack and Hip Hop Documentary. Ross is featured in the 2015 two-part documentary Freeway: Crack in the System, which details various levels of the drug trade, the Iran–Contra scandal, and mass incarceration. In 2016, the documentary was nominated for an Emmy for Outstanding Investigative Journalism: Long Form. Since 2013, Ross has been a regular guest on The Joe Rogan Experience. In the 2014 film Kill the Messenger, Ross is portrayed by Michael K. Williams. ^ "Ricky Ross Biography". Biography.com. Retrieved July 2, 2013. ^ "Law Enforcement Investigations of Ross". United States Department of Justice Archive. Archived from the original on May 31, 2009. Retrieved July 2, 2013. ^ "Dark Alliance: Library". San Jose Mercury News. Archived from the original on April 9, 1997. Retrieved December 14, 2013. A few years before, Ross became involved in cocaine sales, he was a player on his high school tennis team. A college scholarship was reneged once it was learned he couldn't read. The same day, he dropped out of high school his senior year weeks away from graduation. ^ Webb (1999), p. 125. ^ Webb, Gary (August 19, 1996). "Shadowy origins of 'crack' epidemic". San Jose Mercury News. Archived from the original on April 9, 1997. ^ a b c d Sager, Mike (September 25, 2013). "Say Hello to Rick Ross". Esquire. Retrieved November 11, 2018. ^ a b Cockburn, Alexander; St. Clair, Jeffrey (1999). Whiteout: The CIA, Drugs and the Press. Verso Publishing. pp. 6–7. ISBN 978-1-85984-258-4. ^ a b Johnson, Scott (April 17, 2012). "The return of "Freeway" Ricky Ross, the man behind a crack empire". East Bay Times. Retrieved July 2, 2013. ^ Pierce, Charles P. (June 18, 2013). "Gary Webb And The Limits Of Vindication". Esquire. Retrieved November 11, 2018. ^ "Inmate Locator". Federal Bureau of Prisons. Archived from the original on March 10, 2012. Retrieved July 2, 2013. ^ Rocha, Veronica; Mozino, Joe (October 23, 2015). "Former L.A. cocaine kingpin 'Freeway' Ricky Ross arrested in Sonoma County". Los Angeles Times. Retrieved January 31, 2017. ^ Ferranti, Seth (November 5, 2015). "A Conversation with Freeway Ricky Ross on His Latest Run-in with Police and Race Relations in America". The Huffington Post. Retrieved January 31, 2017. ^ Webb (1999), p. 129. ^ Webb (1999), p. 130. ^ Webb (1999), p. 133. ^ Webb (1999), p. 134. ^ Webb (1999), pp. 137-138. ^ Webb (1999), p. 138. ^ Webb (1999), pp. 146-147. ^ Webb (1999), p. 147. ^ Webb (1999), p. 137. ^ "Covert Connections?". PBS NewsHour. November 18, 1996. Archived from the original on January 3, 2014. Retrieved August 29, 2008. ^ "CPI Calculator". USInflationCalculator.com. Archived from the original on October 28, 2013. Retrieved July 2, 2013. ^ Webb (1999), p. 193. ^ a b c d Harling, Danielle. "Freeway Rick Ross files lawsuit". Archived from the original on January 3, 2014. Retrieved 25 June 2010. ^ Barshad, Amos (November 5, 2010). "The Drug Dealer Rick Ross Has Lost His Lawsuit Against the Rapper Rick Ross". New York. Archived from the original on December 29, 2011. ^ Johnson, Bill (July 6, 2010). "Freeway Ricky Ross' Lawsuit Against Rick Ross Thrown Out". The Urban Daily. Archived from the original on March 12, 2012. Retrieved September 12, 2010. ^ "'Freeway' Rick Ross Will Take On Rick Ross In Court Early May". MTV Rapfix. February 29, 2012. Archived from the original on January 3, 2014. ^ "Rick Ross vs. Rick Ross: Rapper sued by drug trafficker for allegedly stealing name". The New York Post. January 11, 2013. Archived from the original on February 19, 2013. ^ Johnson, Luke (August 7, 2013). "Rick Ross, Former Drug Kingpin: 'Why Wouldn't You Want To Emulate Me If You Can't Even Get a Job At McDonald's?". The Huffington Post. Archived from the original on December 24, 2013. ^ D'Amour, Zon (June 27, 2014). "Rick Ross Book signing Event Recap". Los Angeles Sentinel. Retrieved November 11, 2018. ^ Ross, Rick; Scott, Cathy (2014). Freeway Rick Ross: The Untold Autobiography. Freeway Studios. ISBN 978-1-49965-153-9. ^ Kaplan, Erin Aubry (June 6, 2014). "L.A.'s Notorious Drug Dealer, 'Freeway' Rick Ross, is Moving On". KCET. Retrieved November 11, 2018. ^ "Indie Fab Book of Year Freeway Rick Ross Nomination". IndieFab. April 14, 2014. ^ "Freeway Rick Ross is a 2014 Foreword INDIES Book of the Year Award finalist". IndieFab. ^ "American Gangster: 'Freeway' Ricky Ross". BET. Archived from the original on July 9, 2007. Retrieved June 12, 2007. ^ Ramirez, Erika (August 24, 2011). "VH1 Planet Rock History of Crack and Hip Hop". Billboard. Archived from the original on May 29, 2013. Retrieved July 2, 2013. ^ Levin, Marc (March 1, 2015). "A Drug Kingpin, the CIA, and Prisoners". The Daily Beast. Archived from the original on March 2, 2015. Retrieved April 4, 2015. ^ Bihm, Jennifer (August 8, 2016). "Film Documenting L.A.'s Drug Era Nominated for Emmy". Los Angeles Sentinel. Retrieved November 11, 2018. ^ "Joe Rogan Experience #208 - "Freeway" Rick Ross". YouTube. Archived from the original on March 9, 2017. Retrieved May 3, 2013. ^ "Joe Rogan Experience #262 - "Freeway" Rick Ross". YouTube. Archived from the original on November 16, 2015. Retrieved June 3, 2013. ^ "Joe Rogan Experience #323 - "Freeway" Rick Ross". YouTube. Archived from the original on January 18, 2016. Retrieved February 6, 2013. Webb, Gary (1999). Dark Alliance. Seven Stories Press. ISBN 978-1-888363-93-7.